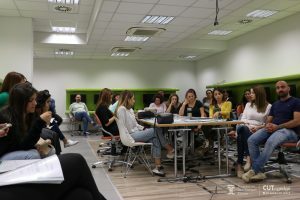 The second meeting of the INTELed Teacher Professional Development (TPD) program was co-organized by the Cyprus Interaction Lab of the Cyprus University of Technology (CIL, https://www.cyprusinteractionlab.com) and the Research center on Interactive media, Smart systems and Emerging technologies (RISE, http://rise.org.cy). 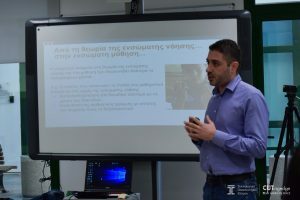 The meeting was delivered successfully by Dr Andri Ioannou, Dr Yiannis Georgiou, Mrs Nicoletta Pantela and Dr Panayiotis Kosmas, on November 3rd 2018, at the Cyprus University of Technology, and was attended by 28 in-service primary education teachers, working with SEN students in various settings (mainstream classroom, special unit, special school). The meeting began with a presentation by Dr Yiannis Georgiou (Postdoctoral researcher, Project manager) on embodied cognition theory, embodied learning pedagogical approach, and taxonomy of embodied learning technologies based on their affordances for sensorimotor activity, immersion, and gestural congruency with the learning content. 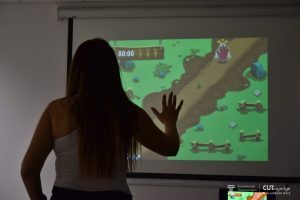 Next, the INTELed teachers had the opportunity to take the role of students in order to understand better the affordances and limitations of embodied learning games. 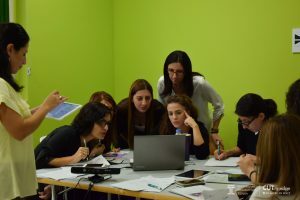 The teachers interacted with “The angle-makers” (https://www.youtube.com/watch?v=-HcwQKNBoI8), “The Young cardiologists” (https://www.youtube.com/watch?v=YFbNSYAJAjo) and the KINEMS games (www.youtube.com/watch?v=3mrrZlumIh0). 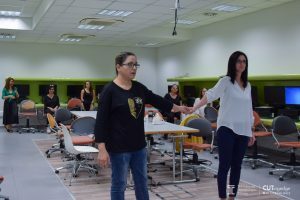 The meeting continued with a reflective activity during which the teachers were divided in groups; each group was asked to develop an integration scenario about one of the embodied learning games. 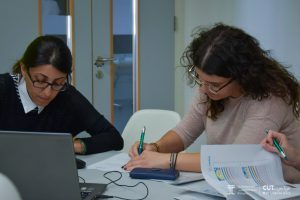 As part of this activity the teachers had the opportunity to collaborate with other colleagues and share their ideas for an integration scenario, focusing on various aspects such as the classroom orchestration, the activity sequence as well as the inclusion of SEN children. The next meeting of the project will take place on December 1st, 2018. Stay tuned by following our INTELed Facebook page (https://www.facebook.com/INTELedErasmus/) for our upcoming news and updates!